Years ago if Hongkong people immigrated to overseas, they usually got tease by saying they couldn't get any job except "peeling potatoes" (a low level job at a restaurant). Not sure if I have ever received such a remark, but I can make quite a few good dishes and bread from potatoes though, like these rustic potato loaves. The recipe is from Leslie Mackie, from the book Baking with Julia. 1 to 3. Dissolve the yeast in the lukewarm potato water for 5 mins. Then mix it with potato, salt and olive oil. 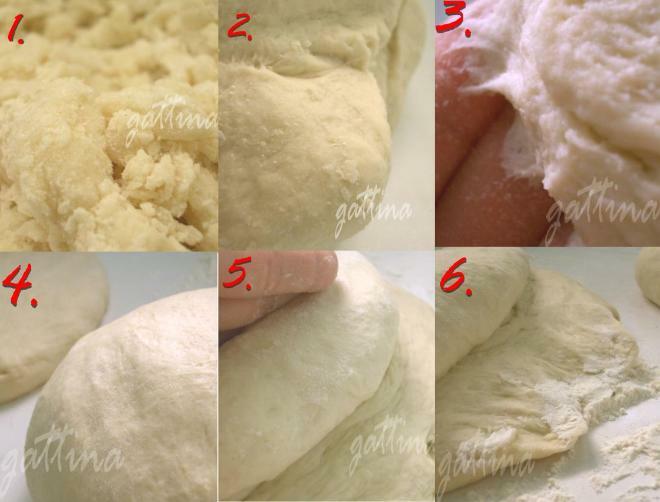 Gradually add in flour, knead, it looks dry and crumbly (pic 1) in the beginning, but it'll come together soon (pic 2). For a while you feel the dough very sticky but don't be tempted to add too much extra flour; later on it turns out just slightly sticky but not wet (pic 3). Knead the dough until smooth, covered and rise for 30 mins. It will have risen noticeably, although it may not have doubled. Pre-heat the oven 375F, place a baking stone in. 4 - 6. Cut the dough in half, take one half, flatten, start rolling from one end until almost to the other end, gently pull that end, stretch it gently, dust its edge with flour, and finish rolling. Rock back and forth a little to taper the ends. Repeat the other dough. 7. Places the doughs on the floured towel, seam side down, covered, rise for 20 mins. 8. When ready to bake, throw three ice cubes onto the oven's flour, shut the door immediately. Transfer the doughs by using the peel (baking sheet for me), let it roll onto the baking stone, seam side up. Before you last shut the door, throw two more ice cubes in. 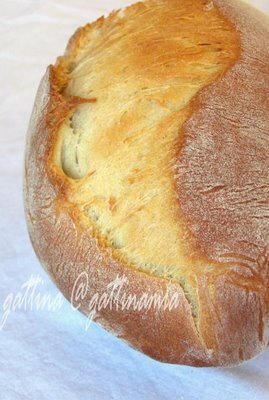 Bake the bread until the crust very brown, 45 - 50 mins, you should hear the hollow sound when you tape the loave bottom. Rest them 20 mins before slicing. Leslie suggested putting butter when the bread's warm. I slathered this bread with dill cheese... wish that time there's a dish of mussels in white wine sauce sitting in front of me too. This is how the bottom crust looks like. These potato breads keep fresh longer than ordinary breads, did you realise, Gattina ? Cos I tried them, I know how lovely they are. I even have pumpkin version of this recipe in my blog, if you want to see.. I've used potatoes to make a number of doughs. I love the taste. 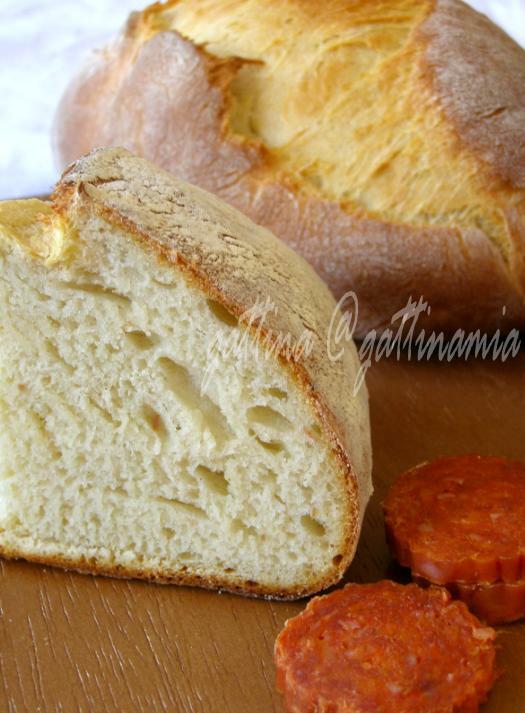 These loaves you made look light and delicious! I lke your blog. Thanks for the deliciouse recipes. surfindaave, thank you! Would love to see your bread some days. alev, thanks for your visit too! Your food photos are always so inviting. Well done and keep up with the good work! Your Loaves looks very good and delicious. This is my first time to visit your blog, also i know you have been living in HK before from your profile, i'm so happy to meet you and also thank you for your sharing!!! Jo, thanks for your encouragement! 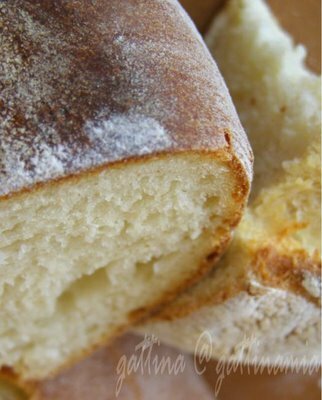 I have been making this bread for YEARS, and yours looks absolutely amazing! You do incredible work! Outstanding!!!!! I made this bread today and it was just delicious. Just one thing, though. Is the amount of water correct on your recipe? I used the 1/2 cup that it calls for, but it wasn't enough, the dough was just too dry, I ended up using close to 2 cups, but it worked perfectly. i will post pictures on my blog soon.